Sunday, March 25 was our last Lenten Sunday, which is celebrated as Palm Sunday, the day of Jesus’ triumphal entry into Jerusalem. It kicks off our Holy Week, which culminates in the holiest of days, Resurrection Sunday (Easter — it’s really called Resurrection Sunday). Since I’ve been serving in a pulpit, I have chosen instead to lead the congregation through what has been called Palm/Passion Sunday, as the Passion Narrative has traditionally only been read at Holy Week services and in our over-scheduled, busy culture, not many people make time for Holy Week services. So even those who come every Sunday of the year would never hear the Passion Narrative if they missed Holy Week. On the opposite side of the city, from the west, Pontius Pilate, the Roman governor of Idumea, Judea and Samaria, entered Jerusalem at the head of a column of imperial cavalry and soldiers. Jesus’s procession proclaimed the kingdom of God; Pilate’s proclaimed the power of empire. The two processions embody the central conflict of the week that led to Jesus’s crucifixion. Imagine the imperial procession’s arrival in the city. A visual panoply of imperial power: cavalry on horses, foot soldiers, leather armor, helmets, weapons, banners, golden eagles mounted on poles, sun glinting on metal and gold. Sounds: the marching of feet, the creaking of leather, the clinking of bridles, the beating of drums. The swirling of dust. The eyes of the silent onlookers, some curious, some awed, some resentful. Pilate’s procession displayed not only imperial power, but also Roman imperial theology. According to this theology, the emperor was not simply the ruler of Rome, but the Son of God … For Rome’s Jewish subjects, Pilate’s procession embodied not only a rival social order, but also a rival theology. We return to the story of Jesus entering Jerusalem … As Mark tells the story in 11:1-11, it is a prearranged ‘counterprocession’ … The meaning of the demonstration is clear, for it uses symbolism from the prophet Zechariah in the Jewish Bible. According to Zechariah, a king would be coming to Jerusalem (Zion), ‘humble, and riding on a colt, the foal of a donkey’ (9:9). In Mark, the reference to Zechariah is implicit. Matthew, when he treats Jesus’s entry into Jerusalem, makes the connection explicit by quoting the passage: ‘Tell the daughter of Zion: look, your king is coming to you, humble, and mounted on a donkey, and on a colt, the foal of a donkey’ (Matt. 21:5, quoting Zech. 9:9). The rest of the Zechariah passage details what kind of king he will be: ‘He will cut off the chariot from Ephraim, and the war-horse from Jerusalem; and the battle bow shall be cut off, and he shall command peace to the nations’ (9:10). The king, riding on a donkey, will banish war from the land—no more chariots, war-horses or bows. Commanding peace to the nations, he will be a king of peace. Jesus’s procession deliberately countered what was happening on the other side of the city. Pilate’s procession embodied the power, glory and violence of the empire that ruled the world. Jesus’s procession embodied an alternative vision, the kingdom of God. This contrast—between the kingdom of God and the kingdom of Cæsar—is central not only to the gospel of Mark, but to the story of Jesus and early Christianity. The confrontation between these two kingdoms continues through the last week of Jesus’s life … Holy Week is the story of this confrontation” (Marcus Borg and John Dominic Crossan, The Last Week: A Day-by-Day Account of Jesus’s Final Week in Jerusalem. HarperSanFrancisco, 2006, pp. 2-5). The whole church proceeded with palms, shouting “Hosanna!” About halfway through the parade I invited a five year old to lead the procession and without hesitation, she stepped right to the front of the line and fearlessly marched onward. Our attention then turned to a reading of the Passion narrative from Matthew interspersed with sacred hymns of the season. I invited the congregation to participate in the story this year rather than just observe, and challenged each one to consider where they are on the spectrum between “Hosanna” and “Crucify!” All of us want to hurry up and get to the “Alleluia!” but we must take our time through this, stopping to consider where we are along the way towards the cross. In his very human prayer he beseeched, “Father, let this cup pass from me.” Jesus knew this cup was a cup of suffering. He had even suggested to the mother of the sons of Zebedee that her sons were not prepared to drink from his cup. And of course we know that Jesus, in his Divinity, willingly drank from that cup, sealing our reconciliation with God once and for all. What is the cup of suffering that has been given to you? Is it something for which you constantly pray, “O Lord, let this cup pass from me?” Is it physical or mental illness? An ailing family member? Neighbors that you just cannot get along with? A child with whom you constantly disagree? What is in that cup for you? Because I have good news: no matter what the cup is, or whether you perceive that you can or cannot drink from it, God will be with you. God is with you. So even when we fail as the disciples did (by falling asleep when Jesus merely wanted their prayers and presence; by choosing aggression in the garden when Peter cut off the ear of the centurion; by abandoning Jesus during the trial and crucifixion), God will still be with us. There is no cup too bitter or too full of sorrow that God cannot share with us. Do you know where you are on that spectrum from Hosanna (“save us”) to Crucify? As we continue to move through Holy Week, please continue to ask yourself that question. Having your palm from Sunday hanging in your home can be a visual cue to be mindful that Holy Week happens perpetually in our faith. We are always a people who shout “Hosanna” in our desperation, or when it is convenient, or part of what the crowd is doing; and constantly poised to be a people who shout “Crucify” when we aren’t willing to risk anything for our faith, or when being a Christian is inconvenient, or when the rest of the crowd is denying Christ as well. Most congregants chose to leave their palms at church on Sunday. I’ve saved them, as I do each year, because our Palms from Palm Sunday become next year’s ashes for Ash Wednesday. Please drop by the church and pick up a palm to hang in your home somewhere as a reminder of our fickle nature, as a reminder to consider if you’re living in the Hosanna or the Crucify. Then next year on Ash Wednesday you can burn your own palm or bring it to the church to be turned into ashes for our Ash Wednesday service. Here’s an article with other thoughts about what you can do with your palms. We’ll be taking our faith wide after Easter. . . Note: Sensitive issues of Sexual Health and Reproductive Rights discussed in this blog post. Since the very first Commission on the Status of Women, Harmful Practices have been examined under the specific lens of Harmful Practices against women. The two chief practices that I have been learning about and for which we still advocate against are Female Genital Mutilation (FGM) and Child Marriage. Because these harmful practices are based in tradition, culture, and even sometimes religion, they are quite difficult to “Legislate out.” Even when laws and regulations are agreed to at the State level, even when penalties are placed on the perpetrators, these traditions are still being carried out at the family and local level. For example, on my visit to the Eritrean Ministry I learned that FGM has been outlawed for many years, but devastatingly, over 87% of Eritrean girls are still being cut. Youth Champion Advocate and nurse Smriti Thapa explained how her nursing clients were between 15 and 20 and typically on their 3rd pregnancy. She told about “Kamla”, a 16 year old who suffered the loss of her stillborn baby through a failed home delivery after which she hemorrhaged and in emergency surgery her uterus was removed. She had been forced into a marriage with a 30-year-old. She was the second child wife to this man, who had lost his first young wife to child birth. Ms Thapa explained that these young women have no control over their bodies and no access to contraceptives. In Pakistan, marriage is glorified by the young girls who look with excitement to the day when they get to wear the beautiful traditional wedding clothes and jewelry. The problem is that these young women’s bodies are not ready for childbearing, and that they do not know Basic Life Skills or understand things like birth spacing and contraception. Pakistan is trying to curb this through innovative sexual education programs and teaching reproductive rights to girls and boys at an early age. It’s a “long game” approaching it this way, but through the education of the youngest generation, Pakistan hopes to change gender norms and challenge tradition. Pakistan is serious about this education: they will be teaching basic life skills and the consequences of early marriage to 4700 schools through training 1000 master teachers in the next 60 days! Bravo, Pakistan. Auxilia Ponga works with faith-based communities to champion women. She is working on improving maternal and child health. Her approach is important to challenging traditional practices as she works with tribal chiefs and religious leaders to teach about the dangers of child marriage. Since focusing on the local, rural areas, the effort has lowered the incidence of child marriage from 42% to 31%. Many times, families feel forced to sell their children into marriage (or trafficking, which is another topic altogether) because they can’t afford the school fees or even afford to feed their children. So Ms. Ponga is working with faith-based organizations to pay school fees, lessening the chance that girls will be married for financial relief. They have raised awareness that Child Marriages are more subject to violence; and have begun teaching life skills and rights. They empower the girls in school through comprehensive education in sexual education. An important lesson learned from Zambia is that boys must be taught this information and these skills as well as girls, as teaching only the girls has not been as effective. Though learning about harmful practices is devastating, I see hope in the unique approaches these countries and organizations are trying. My delegation, Ecumenical Women, is a coalition of many denominations across the globe who recognize the importance of Sexual Health and Reproductive Rights, and we are unique among the religious organizations as we advocate language for the final statement that will encourage education and empowerment for women and girls in respect to their reproductive rights. In other panel discussions this week, I have been challenged to begin to consider some of our western practices as harmful as well, as the list of practices has not included some of our long-held rituals of initiation like binge drinking and hazing. I would love to hear what your reactions are to these traditional practices. Please also take a moment to consider what harmful practices your own traditions, cultures, and religions support without giving thought to the long-term consequences. Spending 25 years in ministry and education in rural areas, I have an immense amount of passion for women and girls who grow up in these areas. Growing up in an urban area gives me an even wider perspective on education and opportunities within the rural setting. I didn’t realize how incredibly fortunate I had been to grow up in an urban area until I saw the difference in opportunities for rural students. What I’ve noticed in our midwestern rural settings are that there is a much heavier emphasis placed on sports than arts, and that the number of extra-curricular groups are diminished in comparison to the urban setting. Diversity is rare, and so there tends to be a narrower perspective as far as the acceptance of alternate views (traditions, religions, etc.). Furthermore, not every student’s particular needs can be met within a social context, and services for special needs are sometimes more difficult to receive. Of all the places I’ve serve, I see that Grand County fills a lot of gaps for its students to provide access to the arts and a diversity of extra-curricular activities like Brain Bowl and Model UN. Beyond education though, our rural area presents issues in transportation and housing, as well as access to services such as health, mental health, and even things we struggle with daily like cell service and Internet access. The global rural issues are similar to ours, but magnified by about 1000%. Access to all of the issues listed above is more limited, and it is all compounded by a strong sense of tradition and culture. These traditions and cultures in the rural areas seem dominated by historically patriarchal leadership and a very strong sense of machismo. What I hear repeatedly in the many panels I have attended is that harmful practices like Child Marriage, Early Pregnancies, Violence against Women, and Female Genital Mutilation are intensified in rural areas, and indigenous women suffer the most of all rural people. 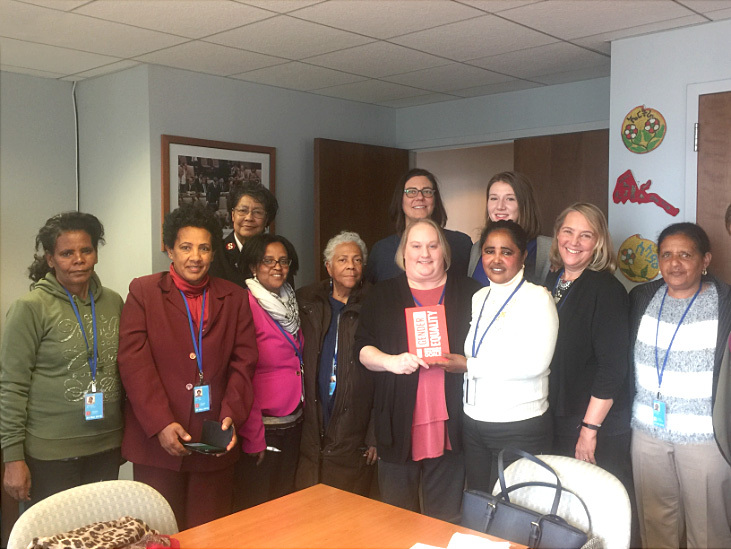 Today I visited the Consulate of Eritrea with a mostly Presbyterian delegation representing Ecumenical Women. This is a young country, located in the Horn of Africa, liberated and independently governed only for the past 26 years and signers of the CEDAW since 1996 (Convention to End All Discrimination Against Women). They are fighting hard within their own country to promote equality for women, and have established gender quotas for leadership within the country. FGM and child marriage has been outlawed there, and both are punishable by law, but they are still very prevalent in the rural areas because women and children do not know their rights. I was so appreciative of the Eritrean Ministry to receive us so wholeheartedly, and to listen with such interest at our platforms. We listened as well, applauding this young country’s efforts to create gender equality. We were welcomed by their entire CSW delegation – five women and one man. Greetings from the United Nations building on the East side of Manhattan. I’ve been here since Friday, taking in lots of Advocacy Training from my Presbyterian Church (USA) Delegation and enjoying exuberant worship with the Ecumenical Women delegation. The PC delegation is made up of about 20 women of all ages. The larger delegation, the Ecumenical Women, has our global partners as well as our US Lutheran (ELCA), Episcopal, UCC, and United Methodist brothers and sisters (among many many others). What a joy to work with these new friends as we advocate for the rights of women and girls in rural areas. Both the PC(USA) and the Ecumenical Women Council are NGO’s or “Non Governmental Organizations.” At the UN we have voice, but no vote, so I’ve been learning how to use my voice to influence change. The history of advocating for women at the UN is rich. I encourage you to learn more about it by clicking here. The most important highlights of this history would probably be the “Convention for the Elimination of All Forms of Discrimination against Women” (CEDAW) in 1963. It was an attempt to state in one document the standards agreed upon concerning women’s rights since the inception of the Commission in 1946. CEDAW was officially adopted by the UN in 1979. The United States remains as one of the very few Member States that has not signed on to CEDAW (shocking and frustrating at the same time). Conferences in Mexico in 1975, Copenhagen in 1980, and Nairobi in 1985 led to the 4th World Conference in Beijing and the Beijing Platform for action of 1995. My dear friend, Dr. Susanne Jalbert, was a presenter at the Beijing conference and shared her recollections of the event with me. We are so blessed and privileged to have her expertise and passion in our community. This summer, Dr. Jalbert and a group of empowered women kicked off an initiative to develop leadership skills in our very own rural girls through LEAD (Learn, Educate, Achieve, Dare), which was formerly called “Girls Leadership Council of Grand County.” We have two girls from CEH who are participating in this flagship leadership program right now: Krista Conrad and Emily Lantermans. I’m so grateful to be representing Rural Women here this year. Thank you so much to the great community of CEH and Grand County for helping me make it here this year. I’ll be posting tomorrow about the similarities I have found between our global rural partners and Grand County! Through this season of Lent we are looking at our faith lives as a cup. Last week we explored the significance of using an ordinary object to help us contemplate our faith. You can read about it by clicking here. Sunday, March 4, we used the story of the prophet Elijah, exhausted and worn out from his trials with Queen Jezebel and King Ahab (1 Kings 19:1-18). Poor Elijah was an empty cup. His life was being threatened and he had done everything he felt he could for God. So he curled up under a broom tree in the desert and cried out to God, “I QUIT!” He basically gave up. “O Lord, take away my life.” I mean, that’s about as empty as you can get. The thing is, God wasn’t done with Elijah yet. It seemed like everything was working against him, but GOD was working for him. Elijah slept, and was awakened at intervals by angels who fed him cake baked on hot stones and filled him with water. He was cared for and nurtured and eventually was able to make the 40 day journey to Mt. Horeb, where God spoke to him in sheer silence. We all feel empty sometimes. In the memoirs published after her death, Mother Teresa divulged that she experienced what St. John of the Cross described centuries ago as “A long, dark night of the soul.” During 20 some years, Mother Teresa could not feel God’s presence in her life. She didn’t lie down under a broom tree though, nor did she throw in the towel. She continued to serve the poorest of the poor and the lepers. She sat next to dying people and held their hands, reminding them of God’s beloved promises. To me, that makes her service all the more powerful. She wasn’t receiving that “holy gratification” of God’s presence and Spirit — but it didn’t keep her from being the very hands and feet of Christ to those who needed her the most. There is an up side to emptying out, too. When our cups are full, we have little to no room to take in more. But an empty cup is ready to be filled. Think about breathing — you can’t take in the healthy and necessary oxygen until you have exhaled the carbon dioxide in your lungs. So when your cup is filled, especially when it is filled with yucky stuff, you don’t have room for growth. This Lenten season, as you study and pray and hopefully deepen your faith, consider the yucky stuff in your cup and recognize when it needs to go so you can make room for the good stuff. Or perhaps you feel more like Elijah — you’re empty and burned out — ready to quit. Remember that even when you feel like you’re done, God is close and ready to send angels to nourish you back to health. Take time for yourself; rest, wait on the Lord. It can be our emptiness that opens us to growth and renewal. Sunday was a momentous day for our congregation as we ordained and installed new officers for our church leadership. Mark Lund, Cathy Lile, and Jake Bolen were ordained and installed as deacons; Bob Gaskins and Dylan Cormican were ordained and installed as Elders. You may be asking what our “Lenten Cup” has to do with Ordination. Well — here’s how I see it. Sunday I told the stories of several lovely tea cups, coffee mugs, and basic, utilitarian glasses that I had brought from home. By telling the stories of the cups, you all came to understand why each one was special to me. I think the most telling one may have been the coffee cup from my mother’s china set. She was married in 1964, and I recall using that china only one time — for one of my parent’s milestone anniversaries. The cup I shared on Sunday morning still had the German manufacturing sticker on the bottom; my mother had always said she was saving it for something “special.” Unfortunately, Dad died in 1992 and we never used it after that. Mom died in 2012 and was perhaps still waiting for something special. “Okay, Paula” you might be thinking. “Enough about the cups — what do they have to do with my faith?” Just follow me. . . I’m getting there (I promise)! Cups are essential to our life, as we cannot live without water and fluids. So even if we fashion a cup out of our hands at a crystal-clear mountain stream, we can still see those hands as a cup and they share the same basic characteristics of any cup: they have the capacity to be filled; they have a limit to how much goes in; every one of them is different. Esther De Waal puts it well; ‘The Celtic approach to God opens up a world in which nothing is too common to be exalted and nothing is so exalted that it cannot be made common.’ They believed that the presence of God infused daily life and thus transforms it, so that at any moment, any object, any job of work, can become a place for encounter with God. (click here to read more about Celtic Spirituality). The features of an ordinary cup that teach us so much about our own life and our faith is several fold. Like the stories I told about each cup on our Communion table last week, we each have stories of our own that make us unique, special, and treasured. Like the cups on the table, we each have the capacity to hold something — good stuff or yucky stuff. And like the cups on the table, we each can be filled with only so much (which makes what we fill our cup with all the more important). So — that’s what we’re doing. We will first clean the yucky stuff out of our cup and then work on what it is that we put inside. And as a special charge to our newly ordained officers, I reminded them that we have many assorted and unique cups in our church family, and it is their calling to minister to all of them, regardless of what the outside looks like; and encourage them to look compassionately at what is on the inside. I pray that this Lenten season offers you many opportunities to experience the “Holy” in the “Ordinary” and that you will begin to fill your cup with the good stuff, so that if you ever begin to spill over, it’s only beautiful, loving things that are flowing out rather than the yucky, sinful and selfish things we become so filled with over time.